Words & music: Rob Bendelow. Special guests: Richard Bendelow / Karensa Kerr. Escape Music have already presented you with the double CD Red Sky / Heroes, Saints and Fools (ESM124) which covers the band’s early years. The conceptual CD “Vox in Excelso” (ESM135) was released in 2006 to great acclaim and has earned the band more and more respect. In 2011 we were presented with the fantastic concept album “Marilyn” which was based on the life and times of Marilyn Monroe. 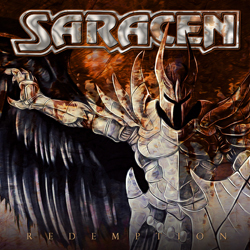 However, shortly after the release of ‘Marilyn’, Paul Bradder and Steve Bettney challenged Rob Bendelow to write a ‘back to our roots’ Saracen album. ‘Redemption’ is the result. A collection of ‘signature’ epic tracks, interspersed with heavy rockers and one beautiful ballad. It also includes complete re-works of two anthems from the 1981 debut album, ‘Heroes, Saints and Fools’ – namely – ‘Crusader’ and ‘Ready To Fly’. Track no.2 on the album – ‘Reacher’ – was inspired by Jack Reacher, the fictional creation of best-selling author Lee Child. Lee heard an early demo of the song and felt that it captured the spirit of his 18-novel, 1-film hero!. It certainly is a great song and rocks along at a fantastic pace. Maybe it will be used on a film score at some stage in the future. Saracen have used the expert talents of Tommy Hansen of Jailhouse studios in Denmark, a man who is no stranger to rock music circles. His work is world famous and his expertise shines through on this exciting new album. British Rock never sounded better.